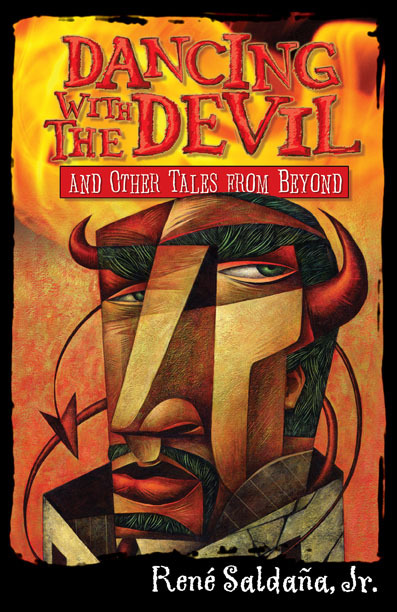 In this collection of stories based on Mexican-American lore, author and educator Rene Saldaña, Jr. spins age-old tales with a contemporary twist. Lauro and Miguel run for their lives with La Llorona’s cold breath on their necks after being caught smoking cigarettes down by the river. There’s Felipe, who s so determined to win back the Penitas Grand Master Marble Champion title that he’s willing to make a deal for a shooter with a supernatural edge. And when Louie’s leg swells up after he cuts his toe playing with a knife, he can’t help but wonder if his mom’s warning could be true. Are his guts really going to spill out of his wound because he cut himself doing something stupid? RENÉ SALDAÑA, JR. is the author of the bilingual Mickey Rangel Mystery series for kids, A Good Long Way (Piñata Books, 2010), The Whole Sky Full of Stars (Random House, 2007), The Jumping Tree (Delacorte, 2001) and Finding Our Way: Stories (Random House, 2003). He lives in Lubbock, Texas, where he teaches in the College of Education at Texas Tech University.